Bush moments after his 12-inch sub is stolen by Wall Street, a key trigger for his leadership revival. WASHINGTON DC, USA -- At the end of last week, it looked as if George W. Bush had firmly established his place amongst the most disliked presidents in United States history,. 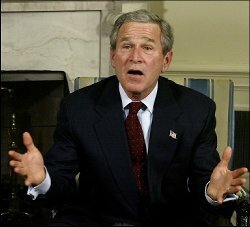 From his economic policies that likely led to the banking crisis, to his legacy of the horrific violence of the Iraq war, to the fact that most news stations now refer to him as "President Fuckface", it's clear that Bush wasn't the most popular guy in America. Or at least, that's what everybody thought, until yesterday when Bush unexpectedly solved all of the world's problems and saved the human race. Late last night, President Bush gave a speech stating that America should "never give up" in the war on terror, "not even if we've already lost." He ended the speech with the powerful statement that "America is the greatest nation in the world." Sources say that Bin Laden heard the speech and immediately committed suicide, according to the Afghani tribal honor code; a spiraling remorse swept all the other terrorists network, as they suddenly forgot how much they hated America and embraced the power of love. Al-Qaeda endorsed “free love centers”, which will soon be established in Afghanistan. But this was only the beginning. Bush's next act was to trip and fall as he walked off the stage. All the insurgents in Iraq were watching the live footage, and the sight of Bush falling on his face made them all laugh so much, they forgot all about their jihad and desire to re-establish the caliphate and decided it would be nicer to live in harmony than to continue blasting each other open with explosives. U.S. troops should be pulled out of Iraq by Thursday. But Bush still wasn't content. He then made another speech saying that "our economy is fundamentally strong." This instantly restored consumer confidence to an all-new height, re-igniting the economic cycle. Spending increased by 254%, profits increased by 190%, and unemployment dropped instantly to a new low of 0.082%, the lowest point since the foundation of Jamestown colony in 1607. Fueled by an explosion of American import and export demand, banks around the world were flooded by businesses and spontaneously became sound again, averting a potentially disastrous global economic meltdown. Bush reportedly plans to rid Africa of AIDS by Tuesday, and teach all the rival religions of the world to love each other by Thursday. On Friday, he will reportedly make a speech that will end all wars and single-handedly lay out plans for a form of government that preserves absolute freedom while simultaneously guaranteeing peaceful, happy, harmonious lives for everybody on the planet, except for a few unlucky people in Bermuda and parts of Peru. Bush's approval ratings have skyrocketed from an all-time low of 3% to an all time high of 120% (many Europeans travelled to the United States just to boost Bush's rating higher than 100). Bush is now expected to be remembered as the greatest president the United States has ever had, and perhaps the greatest leader of all time. His face will now be on the one dollar bill, with George Washington's face being moved to the lower left-hand corner. Barack Obama has reportedly retired to Hawaii, since it is now clear that Presidents will no longer be a necessity in the perfect world that Bush's leadership has given us. This article was nominated to become a featured article; however, due to several votes being devoured by a Great Old One, it didn't make the cut (7.5/15). Don't let this happen again! For just pennies a day, you can prevent another travesty of this nature, or vote for other articles at Uncyclopedia:VFH. This page was last edited on 5 June 2012, at 01:05.